A few weeks ago, we published a blog article featuring 15 examples of brilliant homepage design. And man was it popular! Not even a full three weeks later, the article has already attracted more than 36,000 views. Now, before you accuse us of getting all cocky on you, you should know the other side to the story. Albeit successful, many of the readers of that post ... or at least the ones who like leaving blog comments ;-) ... were disappointed in the lack of industry variety in the examples we showcased, since a lot of them featured homepages of software companies. So ... what's a marketer to do? We could either ignore your complaints, or we could follow The Kinks' lead and "give the people what they want." Agreeing that the latter was a much better choice, we pulled together a downloadable collection of 50 Examples of Brilliant Homepage Design, which features homepage examples from a variety of industries ... not just software. So let's highlight some of our absolute favorites from this collection here, and talk about what makes them so great so you can get some solid inspiration for your next homepage redesign. And if you're looking for more examples, you can always download the complete collection here. 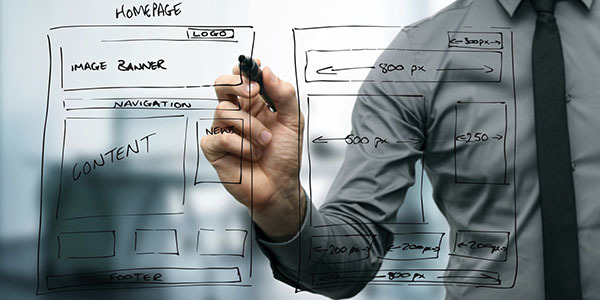 What Makes a Homepage Design "Brilliant"? Clearly answers "Who I am," "What I do," and/or "What you (the visitor) can do here." Resonates with the target audience. Offers great navigation, usability, and mobility. 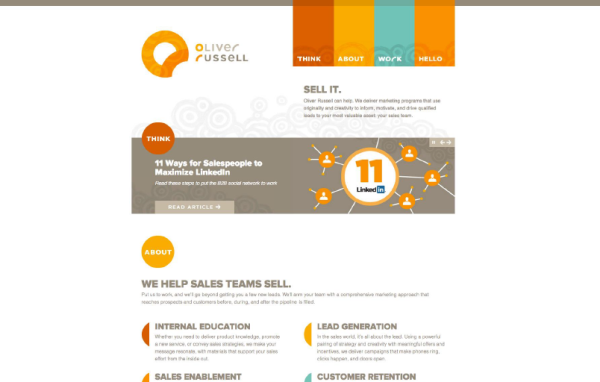 Includes calls-to-action (CTAs) to guide visitors to the next logical step. Has a great overall look and feel. While some of the homepages featured below may not be exemplary of all these elements in one, they were chosen to emphasize specific elements from the list above. If you're considering doing a homepage redesign, do your research and take a look at other websites for inspiration. In addition to the ones featured below and in our downloadable collection, there is no shortage of great design examples out there. Remember that your goal should be to create an aesthetically pleasing homepage that represents your brand, and also provides your visitors with a user-friendly experience. Take the time to learn about your target audience, and create a truly wonderful experience around their specific needs. Austin Beerworks is a craft brewery based in Texas. The colors and presentation of Austin Beerworks' products are just so inviting! 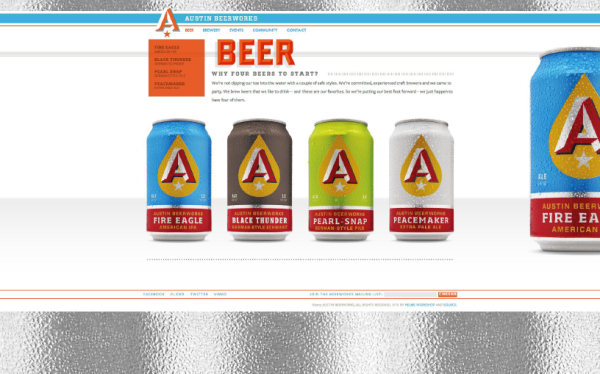 Its clean, white background coupled with high-resolution product images is likely to make anyone thirsty for an Austin Beerworks beer. Oliver Russell is an agency that "builds brands for new ventures and for companies that differentiate through acts of good." The color and subtle design elements in the background make this web page a great example of attractive visuals that don’t take away from the core content on the page. 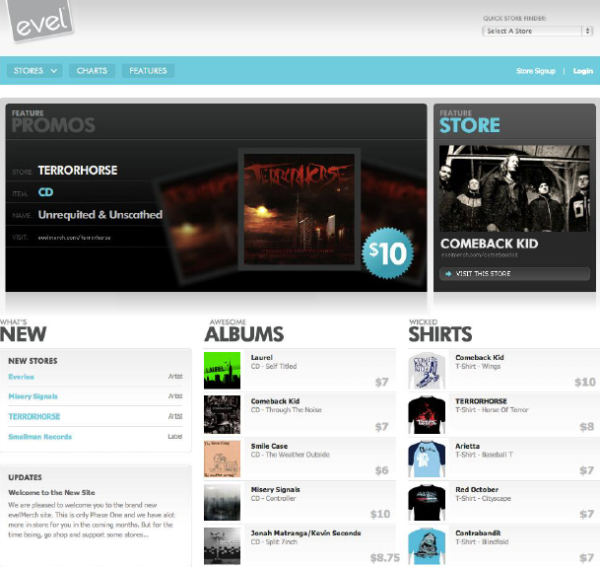 Evel is an ecommerce website selling music and other related merchandise. At first glance, you can immediately tell what this website is selling. The well-organized homepage features various items, attractive slides, and price tags. Captain Dash is a SaaS platform that produces interactive and visual dashboards to help companies organize data. The mock movie poster is fantastic! Although you can’t really tell what the company does at first, this design makes you want to learn more about the intriguing Captain Dash. 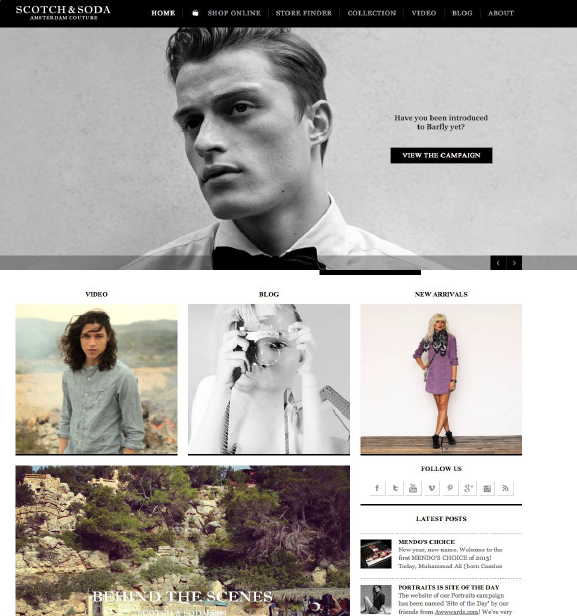 Scotch & Soda is a clothing line based in Amsterdam. The tiled look of this homepage works great for showcasing different areas of the website. Neatly placed social icons make it easy to share, and the “Latest Posts” tab gives viewers access to additional content. 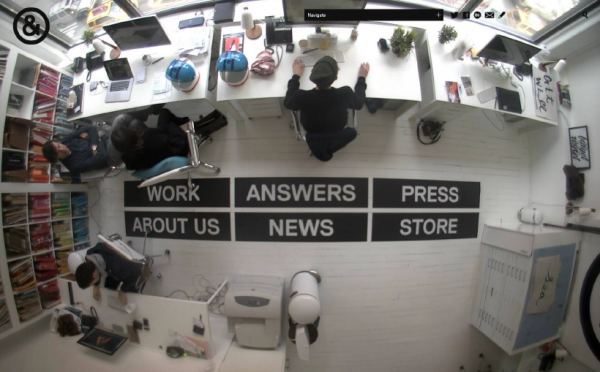 Sagmeister Walsh is a New York City-based design firm. The use of an overhead image of the firm's actual office is truly creative. Each element on the floor can be clicked on, and it definitely sets this website apart from other design firms. Jacqui Co. is a cake and cupcake shop based in Singapore. This homepage is one of our absolute favorites. The look and feel of the website is brilliantly designed, and the interactive elements (play around with them for yourself!) take this homepage to a whole new level. 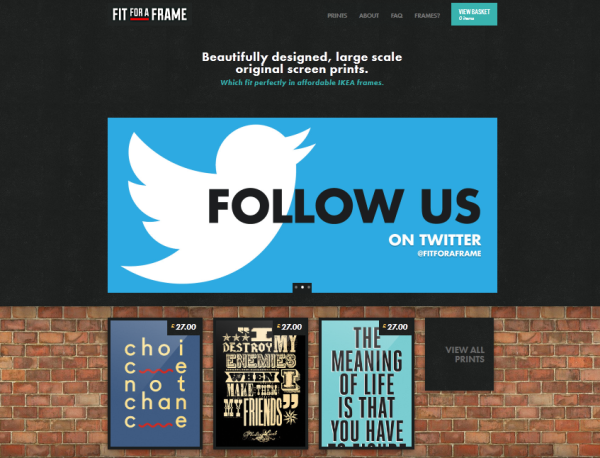 Fit for a Frame is an ecommerce website selling large-scale, original screen prints. A great feature of this homepage is that the highlighted items are neatly presented for all to see. You’ll also notice the simple but attractive scrolling slideshow at the top, which helps give visitors additional information without adding clutter. 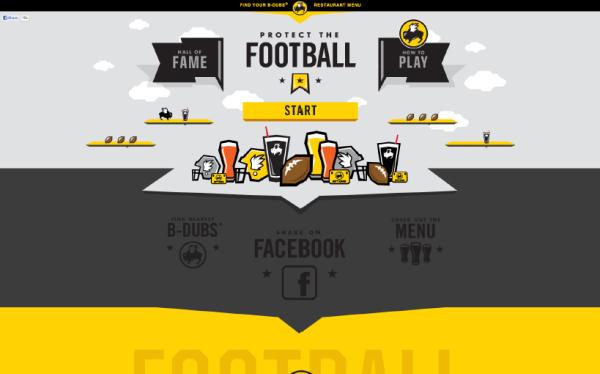 Buffalo Wild Wings is a chain restaurant, grill, and bar. This is a great example of a web page that is built with the consistent look and feel of the brand in mind. Colors, design styles, and fonts are all in line with the company brand and image. Prezi is a cloud-based (SaaS) presentation software and storytelling tool for exploring and sharing ideas on a virtual canvas. 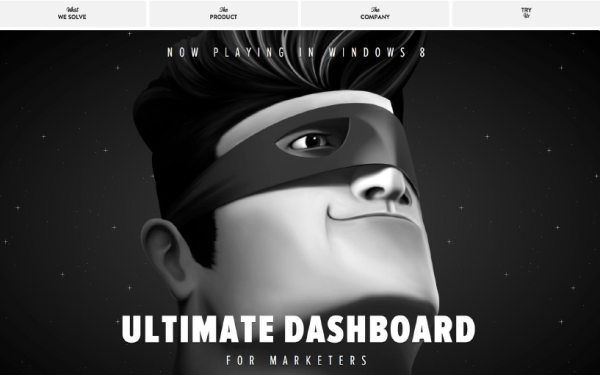 This example is brilliant because of the video embedded right into the main banner of the homepage. Furthermore, it makes complete sense for a company that enables the creation of gorgeous presentations to be great at presenting its own product. 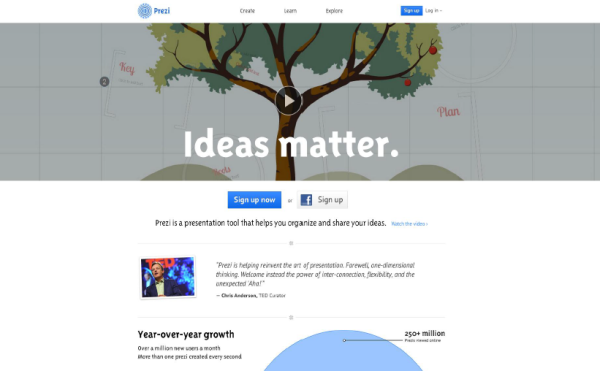 This emphasizes the expertise and credibility of the Prezi brand. 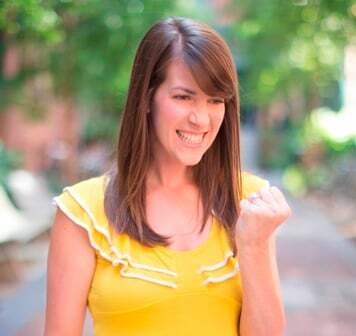 SilkTricky is a boutique digital agency specializing in interactivity and entertainment. 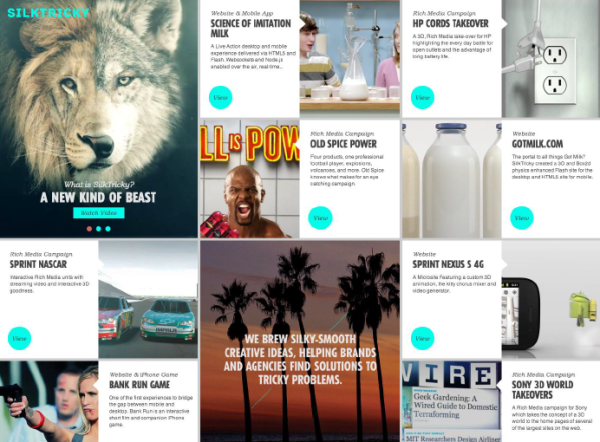 This is another great example of how content can be neatly organized into visual tiles. It presents the content in one area of the screen and does not require much scrolling to see more articles. 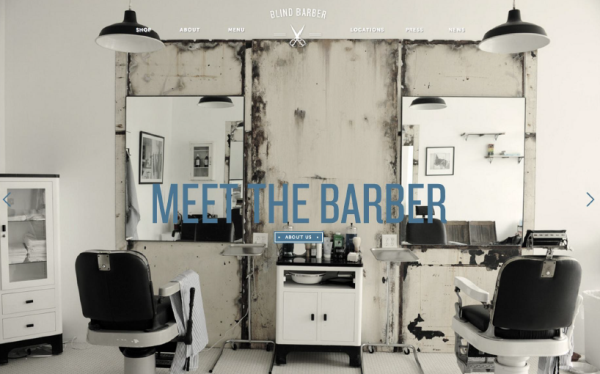 The Blind Barber is a barbershop/lounge concept, with locations in New York and Los Angeles. While the load time on this website is a bit on the long side, this website does a great job of presenting the most important aspect of the site on the center of the page. It draws the eyes to the button and attracts visitors to learn more about the Blind Barber, which leads to an 'About' page and a featured video. 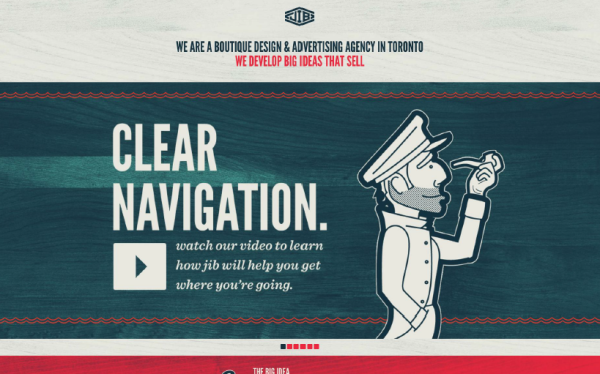 Jib is a boutique design and advertising agency based in Toronto. In addition to the homepage's great job of emphasizing the company's value proposition through video, the colors of this website complement each other perfectly. You’ll also notice the texture of the background that runs with the overall theme of the brand. 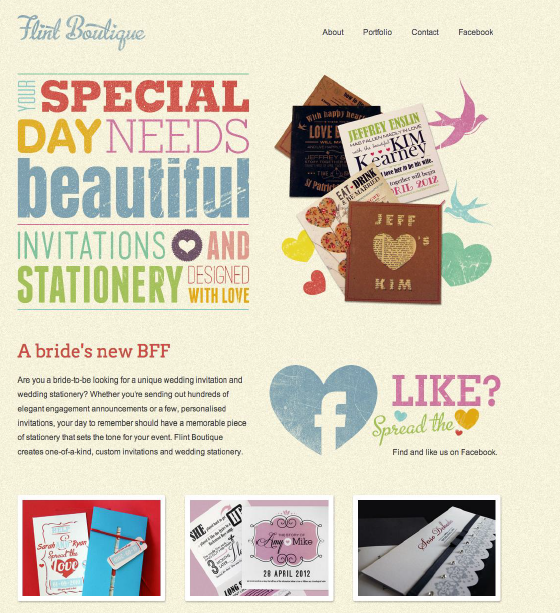 Flint Boutique specializes in designing custom wedding invitations and stationery, wedding favors, etc. 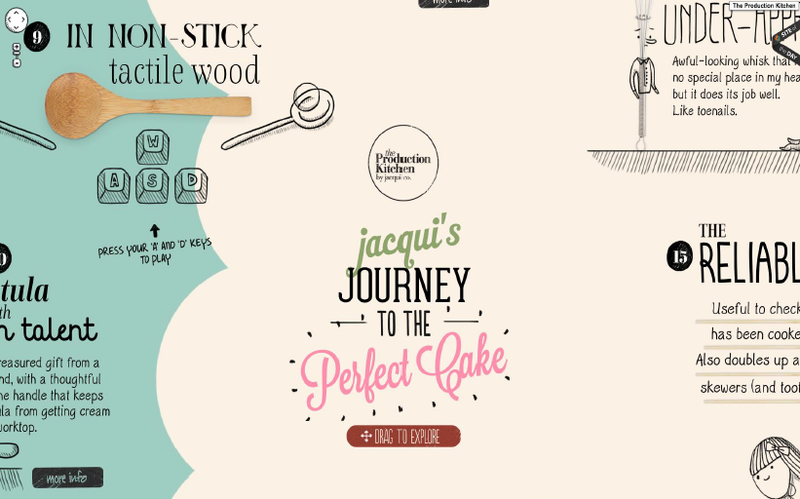 The font and colors play a major role in making this a well-designed homepage. The consistency between the text and graphics and how well they align with the brand also make for a great user experience. 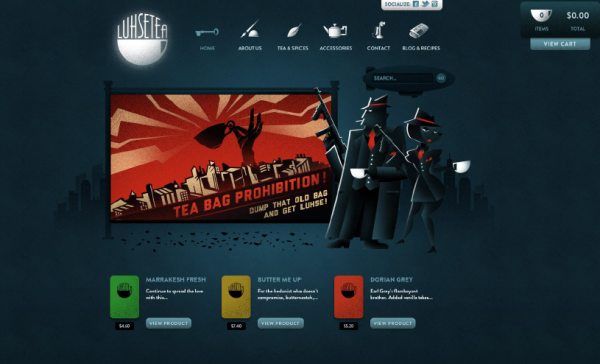 Luhse Tea is an online tea company and ecommerce website. The look and feel of this ecommerce homepage gives the brand a personal characteristic that makes it stand out from competitors. 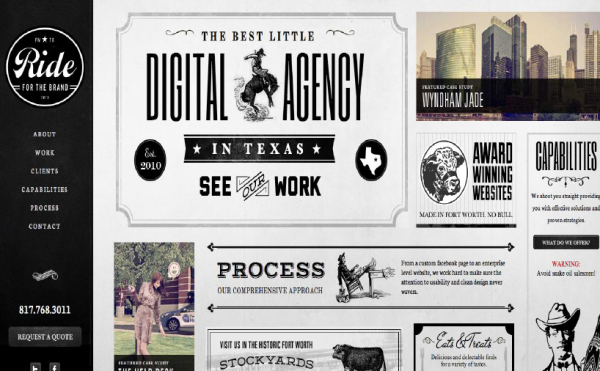 Ride for the Brand is a Fort Worth and Dallas area web design firm. The old school look and feel of this homepage is amazing. The custom design elements set it apart from others and the continuous side scrolling aspect makes it an interesting experience for visitors. 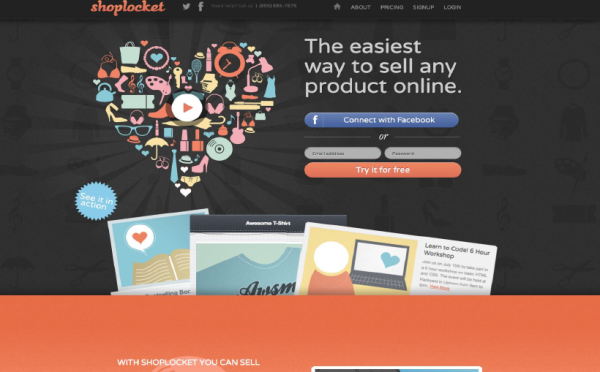 ShopLocket is an ecommerce startup that allows anyone to quickly sell goods online, allowing users to forgo paying for ecommerce platforms just to sell a few items. This is such a simple and very charming design. In addition, the Facebook-enabled sign-up feature reduces friction for visitors who hate completing long registration forms. Ryan Edy is a professional photographer. As a website for professional photography services, this homepage design plays well into what visitors are looking for. The homepage features a simple navigation on the left and a series of photographs for visitors to enjoy. 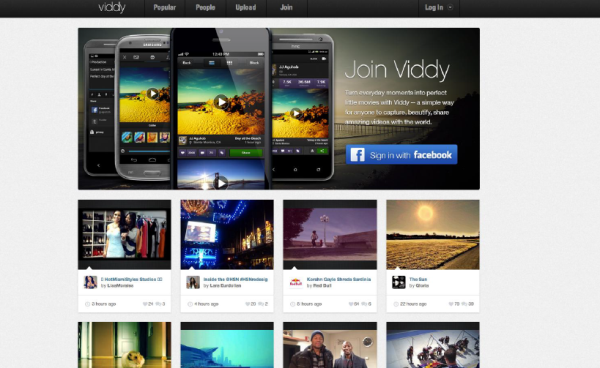 Viddy is a video-sharing app for iPads, iPhones, and Android phones that allows users to post videos of 15 seconds or fewer. This is another great example of a how a clear call-to-action and a “Sign in With Facebook” button can simplify the registration process and increase the number of users for this app service. Grey Goose is a brand of vodka and flavored vodkas that are made using ingredients, a production process, and traditions of the Cognac region of France. Presentation is everything. 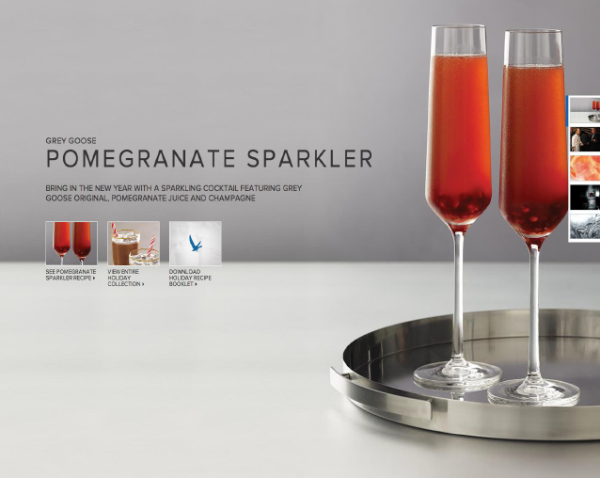 For Grey Goose, it’s about elegant, high-resolution images and a very slick layout. Nothing on this page draws too much attention from the main elements, which feature calls-to-action for recipes and other Grey Goose products. What other homepages do you think are representative of brilliant homepage design?